The Michigan OHSers have coffee and donuts in the outer lobby prior to the convening the meeting. Left-to-right they are Tom Curry, Ed Price, Dana Hull, Jim Wilkes, MaryAnn Balduf and Jeremy Tarrant. Ed Price says it is in the bag, but MaryAnn Balduf is not so sure. 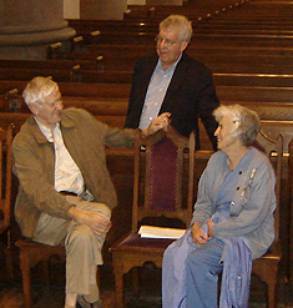 Jim Wilkes (l), Ed Price and Dana Hull catch up on organ talk in the nave of the Cathedral. The beauty of the Cathedral Church of St. Paul surrounds the group. 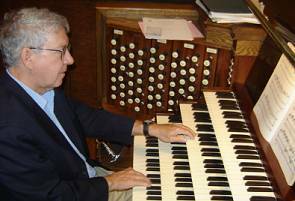 Ed Price whips up some fine music at the console of the Pilzecker organ. A group picture just before lunch at the Majestic Café. Pictured (l-r) are MaryAnn Balduf, Jeremy Tarrant, Tom Curry, Dana Hull, Carl Balduf and Edward Price. 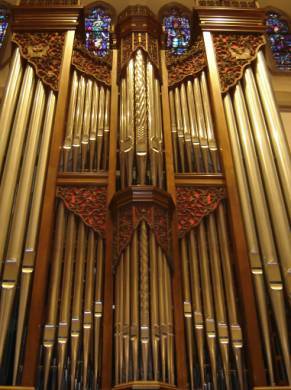 An imposing array of pipes for the façade of the Chancel organ. 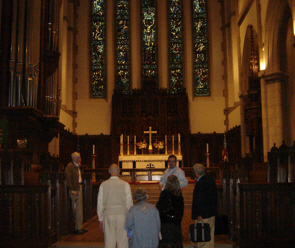 The September 2010 meeting of the Michigan Chapter of the Organ Historical Society convened at 9:40 a.m in the outer lobby of The Cathedral Church of St. Paul (Episcopal-Anglican), Detroit, Michigan. 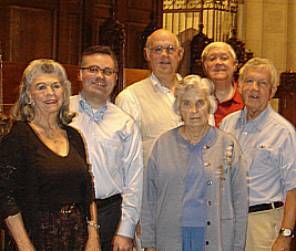 Present were Carl Balduf, MaryAnn Balduf, Dana Hull, Ed Price, Jim Wilkes, guest Tom Curry and member-host Jeremy Tarrant, Organist-Choir Master for the Cathedral. After calling the meeting to order, Balduf apologized for calling the meeting for 9:30 a.m. instead of the requested 10 a.m. The minutes of the May 22, 2010 were unanimously approved. The Treasurer’s report was not available. 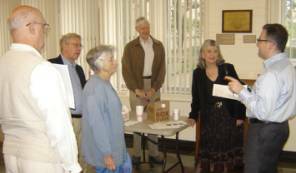 Old business included a discussion of the continuing search for an archive willing to accept the OHS- Michigan historical material. 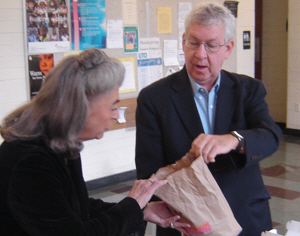 Jim Wilkes was asked to pursue the matter with the University of Michigan Bentley Library. Balduf suggested that the OHS National Archive might be amenable to taking the material. It was, however, pointed out that the National OHS does not currently have an archivist. Balduf reported that the OHS Michigan Web site disc availability will be postponed until after the current meeting season. Balduf then reported that the membership roster contains many names of those who have not paid dues or attended recent meetings, The meeting addressed this issue by unanimously approving the following membership policy. 1. Active OHS Michigan Chapter members are those who have paid their dues for the current program year: from September 1 through August 31. Those who have not paid dues by November 30 will be dropped from the OHS Michigan Chapter rolls and the Chapter’s email list. 2. For the current 2010-2011 program year (only), members will be kept on the rolls and email lists if either 1) they have paid their dues by October 18, 2010 or 2) they have attended a chapter meeting between March 7, 2009 (inclusive) and May 22, 2010 (inclusive) and paid their dues by January 7, 2011. A list of those eligible members will be published in an email to all members. 3. At the discretion of the Chapter President, a limited number of additional email addresses may be kept active for the information of OHS National officers and councilors and other interested parties. Balduf then introduced Jeremy Tarrant, host for the morning, with many thanks for hosting the meeting and supplying coffee and donuts. There being no further business, the meeting was adjourned at 10 a.m., after which the group moved into the Cathedral sanctuary to explore the Pilzecker organ, beginning with an enlightening lecture-demontstration by Mr. Tarrant. For organ specifications and an audio/video demonstration click here. Following the demonstration and open console, members of the group lunched at the historic Majestic Café. 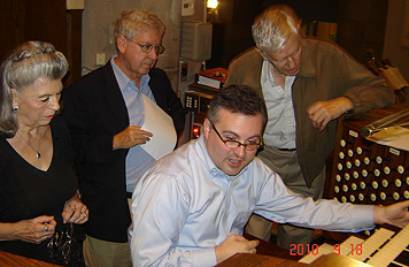 MaryAnn Balduf, Ed Price and Jim Wilkes pay attention as Jeremy Tarrant demonstrates some tonal colors.